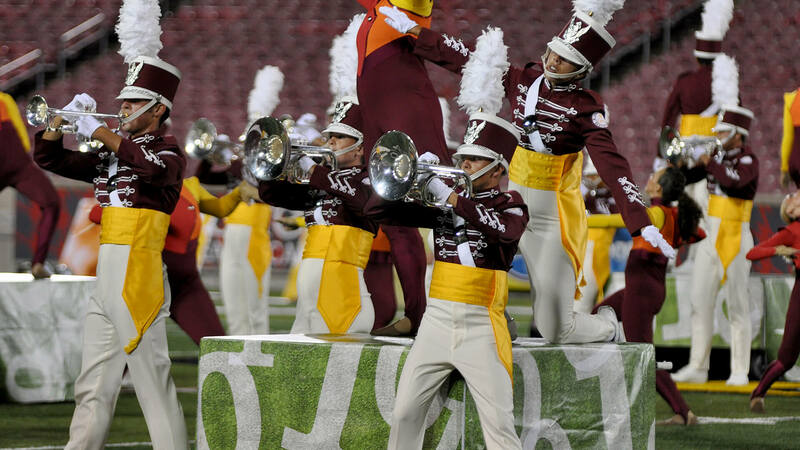 “The Power of 10” trumped the power of weather as the Cadets won their second straight show Friday night in Louisville. Leading the pack after an opening night victory on Wednesday, the Cadets became the first corps this summer to break 70 points (70.900) during this DCI Tour event presented by DeMoulin Bros. The Cadets swept every caption tonight finishing more than five points ahead of their nearest competitor. Despite the large margin of victory, members of the Allentown corps will look to keep improving. Weather was a concern throughout the night, as forecasts predicted storms moving through the Louisville area at competition time. The precipitation held off through the intermission, but a misty rain began to fall as the Madison Scouts performed. The showers stopped as quickly as they came during the next corps’ performance, and the rest of the night stayed dry. The Cavaliers placed second (65.800), quickly improving their score from Wednesday night by almost three points. Baker told audiences to watch for “intense athleticism” throughout the corps’ production this summer. “We want to be the best group of Cavaliers that we can be for this year,” he said. 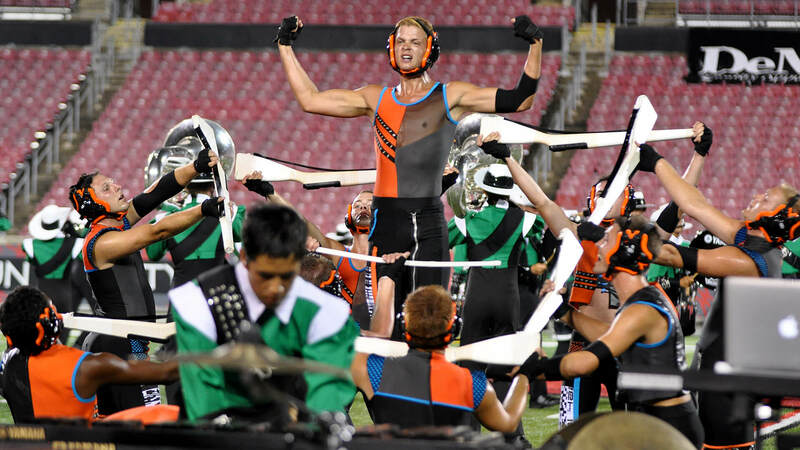 The Madison Scouts edged the Blue Stars by a small margin for the second straight show. Their score of 62.500 put them in third place, half a point ahead of their Wisconsin rival. The Blue Stars placed fourth, with a score of 62.000. Their 2015 production, “Side Show,” explores a carnival, and has a lot for the audience to take in, even after a second viewing. “We have a few characters in the show,” said Blue Stars drum major Hayden McClure. “You probably notice the juggler—that’s in part two. We have a contortionist in part two as well. The clowns come in during the ballad, and—they don’t have their costumes yet—but we also have Siamese twins in the ballad as well." The Blue Stars were one of the corps most affected by the rain. They were forced to keep their front ensemble equipment under tarps until just before their step-off and did not wear their plumes in their shakos during the performance. But McClure says the rain may have had a positive impact on the corps as well. 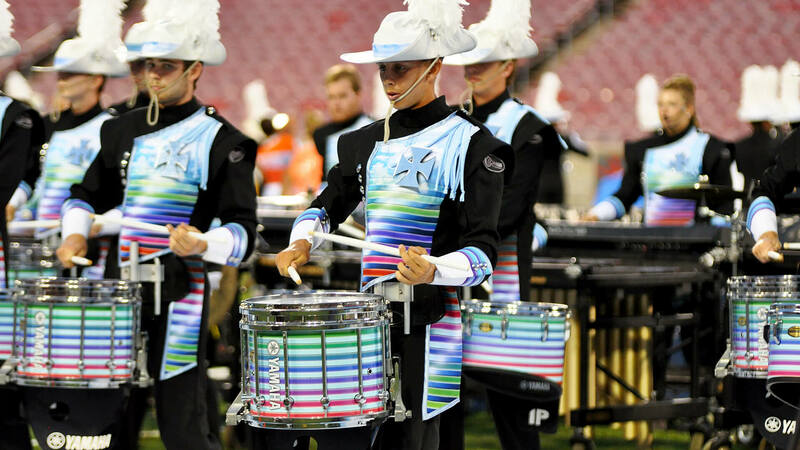 The Crossmen have new uniforms this year, which feature colorful accents. They’re a departure from the corps’ traditional look. Troopers finished sixth with a score of 58.100. The corps originally performed its production, “Wild Horses,” during a joint dress rehearsal with the Madison Scouts on Monday in Indianapolis. Spirit of Atlanta was originally scheduled to compete, but due to transportation issues was unable to make it into Louisville. The corps will now make its competitive debut in Plainwell, Michigan, on Saturday. Looking ahead, the Crossmen and Madison Scouts will rejoin Spirit of Atlanta in Michigan tomorrow for the Legends Drum Corps Preview. Meanwhile, the Troopers, Blue Stars, The Cavaliers and The Cadets will continue their tours tomorrow in Akron, Ohio.